Harry Keramidas, a veteran of the movie business, was instrumental in getting the Ashfield Film Festival off the ground. He’s holding the mascot, Baby Cecil. 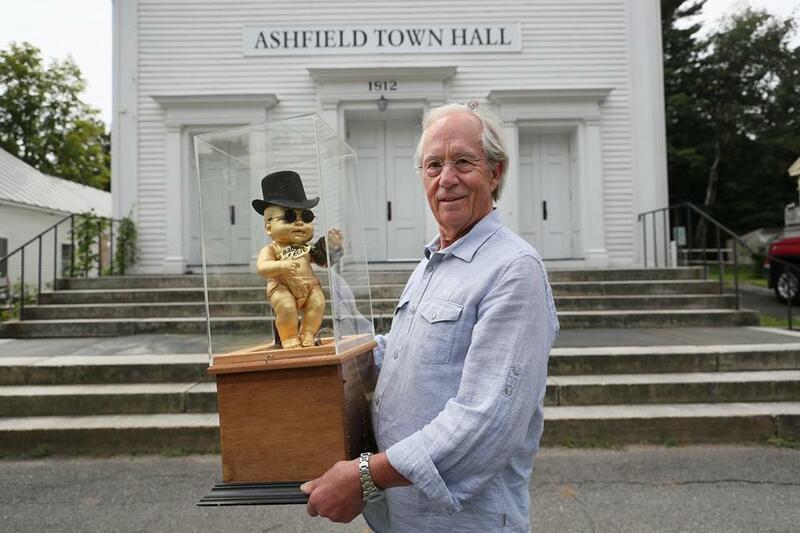 ASHFIELD — When Christopher Seward and his family were ready to leave New York City, they came here to Western Massachusetts, looking for a new home. Seward, who grew up in Deerfield, is a documentary film editor who has worked with Michael Moore, among others. While showing a property in the tiny town, Seward’s realtor mentioned that he was heading over to the local film festival. He invited Seward along, and the filmmaker was instantly smitten. 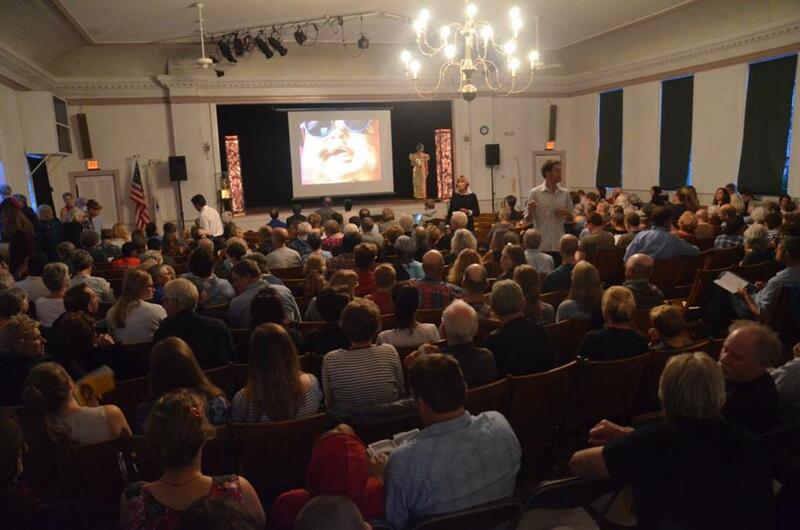 Not only did the Seward family move to the Ashfield area: Christopher Seward quickly became cochair of the Ashfield Film Festival, the town’s delightfully daffy, completely community-produced annual soiree. Now in its 11th year, the festival features five-minute films created by the working folks, gentleman farmers, and schoolchildren of this agrarian community of 1,700, where there is no cellphone service and the town diner and the supply store across the street qualify as the sole hotbed of activity. The festival, which takes place this year from Sept. 13-15 in Town Hall, has gradually caught on among filmgoers. Last year, they put up an ersatz Hollywood sign — Hillywood — on the slope nearby. Ashfield, about 30 miles north of Springfield, happens to be the birthplace of the legendary film director Cecil B. DeMille, who lived here all of three days. (The Tinseltown titan’s parents were here on vacation.) A dozen years ago, another product of Hollywood moved to town. Harry Keramidas had honeymooned nearby a decade before that; his wife is a Smith College alum. Harry Keramidas, the founder and director emeritus of the charming and unusual Ashfield Film Festival. Keramidas was retiring from a long career in the film business, having edited “Back to the Future,” “Bustin’ Loose,” and many other films. He was quickly recruited for the Ashfield Cultural Council, where a colleague, Tamsen Merrill, persuaded him to help launch a local film festival. Sitting around a table with her fellow organizers in the town diner, Elmer’s Store, Merrill says she figured the films should be shorts. “You can probably watch anything for five minutes,” she explains. As it happened, many of the films they’ve screened have been much more than merely tolerable. They’ve shown over 150 to date, and the residents still chuckle over plenty of them. There’s the “Mamma Mia!” tribute, which features dozens of the town’s women of every generation, and the “country wisdom” tutorial explaining how to salvage an old pair of blue jeans with silicone. There’s Gayle Kabaker’s fanciful series on the dastardly Mr. Jones, the corporate baron who wants to steal the secret recipe for Elmer’s world-class pancakes. The third installment of Kabaker’s “Pancaper” trilogy is set to debut this year. Little Ashfield is sending its filmmaking ripples out into the wider world, too. Festival alumni Bennett Duchin and Galen Knowles are both working professionally as documentary filmmakers. This year the PBS Online Film Festival featured “The Book Club,” an enchanting stop-motion short first made for the Ashfield Film Festival by 18-year-old local Tobias LaMontagne. Another Ashfield native, Ben Tobin, is set to graduate from Brooklyn College’s graduate school of cinema. As a young man, he watched all kinds of regular folks in his hometown filming each other for their submissions to the festival. “It’s totally not weird,” he says. Now he’s working to finish his debut feature-length documentary. For the first time this year, the festival has opened its submissions to include residents of the neighboring towns of Buckland and Shelburne. The home that Seward ended up purchasing is technically just over the town line, in Buckland. “He had special dispensation,” jokes Merrill. 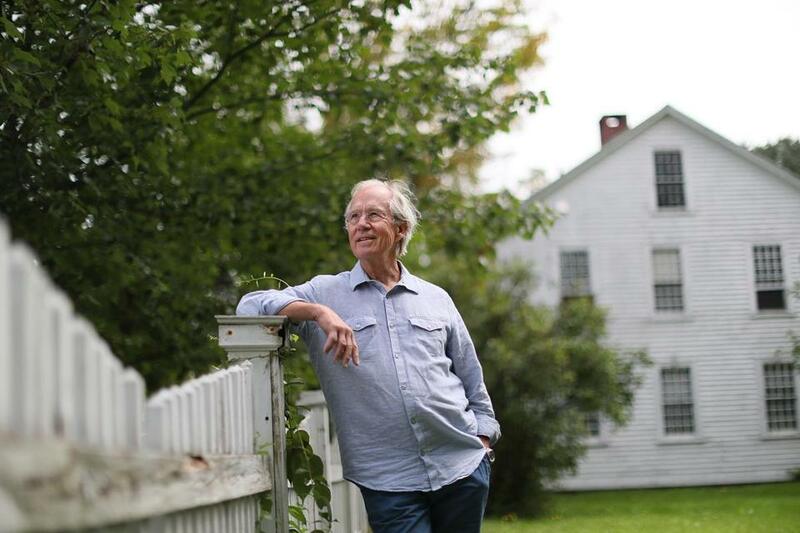 “A lot of folks have a story to tell, and they told it,” adds Seward, who effectively bumped Keramidas upstairs — to “emeritus” status — when he assumed the cochair duties with Tamara Sloan. Part of the transition process has been to create a “bible” for the festival, as Seward puts it. Until the cochairs took over, as Sloan says, the organizational details for the festival were all in Keramidas’s head. A screening at Ashfield Town Hall during last year's film festival. He points to the “guerrilla”-style filmmaking of farmer and educator Ben Murray, who runs summer camps for kids at Red Gate Farm. Each year Murray submits at least one film, which he typically tosses together with minutes to spare at the deadline. Two years ago, he won the Grand Prize with “A Little History,” in which his family told the story of the farm through his children’s eyes. That’s one of the main reasons the festival has become such an impressive source of community-building. Walking a visitor through the great room in Town Hall, where a quarter of the town’s residents will gather in the dark in a few weeks, Keramidas points out the democratic nature of the makeshift movie theater.